ATI AK-47 TactLite Stock Package With Scorpion Recoil System FDE Flat Dark Earth Furniture AK-47 Synthetic Stock, Grip and Forend Package Kit. The AK47 stock kit is six position adjustable and it can be fired from Folding stock position. Traklock Stock System Eliminates Horizontal & Vertical Movement of the Stock on the Buffer Tube Provides Smooth Secure Stock Adjustments Eliminates the Need for Secondary Locking Mechanisms. No Snag Points. Has Thin Scorpion Recoil Pad, Dual Sided QD Sling Attachment Point. 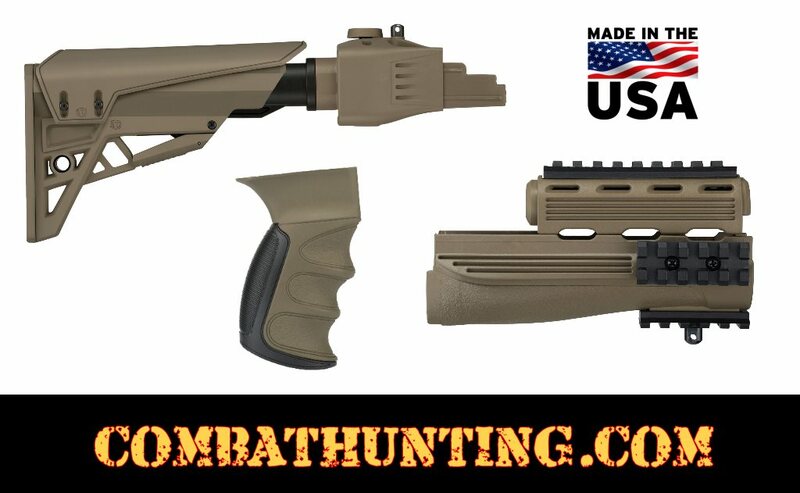 Scorpion Recoil System Razorback Recoil Pad Non-Slip, Removable Scorpion Recoil Pistol Grip Wih Sure-Grip Texture Recoil is Impact is Absorbed Shooting any Load Size can now be Done with No Pain being Transferred to the Shooter. Reduces the Challenge to Reacquire the Target by Minimizing the Muzzle Lift. Stock Not Affected by Chemicals. Pad Remains Flexible in Extreme Temperatures Removes Limitations from Spring and Piston Type Recoil Suppression Systems. Military Type III Anodized, 6061 T6 Aluminum Six Position Commercial Buffer Tube. Aluminum Receiver Mount. EC922R: ATI products are manufactured in the USA and count towards compliance parts. Contact your local gun shops or shooting ranges for this and other compliance issues.